Life Before the Dinosaurs: Kimberella. 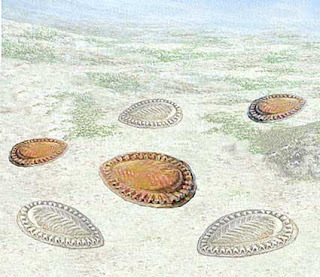 Kimberella was a strange creature that could have been a mollusk and lived in the Vendian Period. It had a strange lasagna-shaped foot and a flattened shell on top. It was 1/2" to 4". Kimberella crawled along the sea floor looking for edible scraps because organisms didn't start predation until the Cambrian Period. Kimberella was a very weird creature because it had a shell and why would something have a shell if there was no predator? It did have a pretty hard shell. My guess (about why it had a shell) is that it may have lived in shallow waters and even ventured on to land- the shell acting as a shield against the sunlight. That's a good idea. 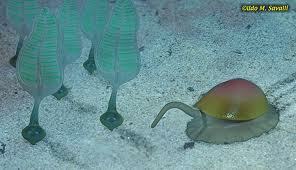 Because you know how today's snails crawl out of the water sometimes! Cool blog ABC! I've been resisting picking a favourite fossil as I try to be impartial (being Director of the Lyme Regis Fossil Festival and all... www.fossilfestival.com), but I think I just might have to give in now. Don't think Kimberella ever visited our Lyme Regis beaches, but hope you do one day! Thanks! My little brother loves it too, but he loves it because he thinks it look like a sandwich, and he likes to eat it. It does look like a sandwich, with lots of green and purple lettuce. OK, now I'm hungry. Thinking about that shell, too. I wonder if anything then left the water. Have any fossils of Kimberella been found in surface deposits (dunes or land slides)? Are there any surface deposits of the right age to look in? 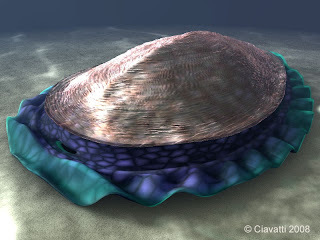 What other things in the environment may have made a shell advantageous? Would such a shell have provided some stability in a high current? If high currents, were there rocks or pebbles moving rapidly enough to be dangerous? My first thought was of a hard hat (which I wear for work) as protection from falling objects. Kimberella is the only animal before the Cambrian time that had a chest cavity for internal organs! Since no other animal in the pre-Cambrian times had this could this animal be the missing link to higher life which spun off to other life forms, and eventually to man? I do think that could be possible!